John Chrysostom begins in the same way as most commentators, by talking of the wisdom God wrote into the visible creation, the things he made. Through these, he says, we could come to know God “by drawing connections” (ἀναλόγως) from creatures to the Creator. However, we did not in fact make the proper connections–we did not, John argues, “want” to get to know God this way. Instead, we fell into ignorance and idolatry, worshipping creatures as if they were the Creator. So God decided to bring the saving knowledge of himself to the world another way, not by arguments from the nature of creation, but through the faith that comes by the preaching of the Word. Thus, human wisdom is rendered null and void, needless. As other commentators, Theophylact argues that there is a wisdom available through the creatures God has made, and that this can even be called the “wisdom of God.” The “Greeks,” however, those who only pay attention to what is visible and what makes for beautiful and persuasive speech (i.e., rhetoric), did not know God through this wisdom of creatures. Instead, they fell into idolatry and ignorance, failing to learn the lesson their ”teacher,” the wisdom of creation, had to teach them. 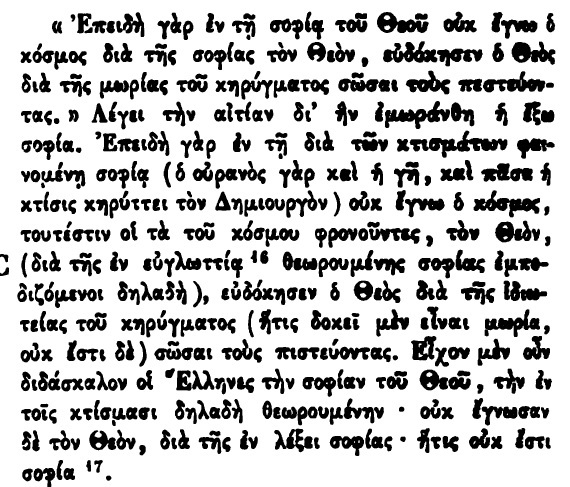 A new lesson had to be prepared for them, then, in the preaching of the gospel, which God chose to operate through people without education (ιδιωτεια, what I’ve translated here as “illiteracy”) in order to get the Greeks to focus their attention somewhere else: not on “external wisdom,” but on spiritual, invisible wisdom. But he emptied himself, taking the form of a slave, becoming in the likeness of human persons; and being found as a human in form he humbled himself, becoming obedient to the point of death, the death of a cross. The grammar here is theologically significant. (Don’t run away yet!) Jesus empties himself; Jesus humbles himself. These two phrases are parallel: they both use an active verb with a reflexive pronoun. The difference between an active and a passive verb is the difference between “Johnny loves” and “Johnny is loved.” In the first, Johnny is actively loving, he is doing the action; in the second, Johnny is passive, he is receiving someone else’s love. So here in Philippians, we see that Jesus is not emptied by another, nor is he humbled by another. (“Do you think I cannot call on my Father, and he will at once put at my disposal more than twelve legions of angels?” Matt. 26:53.) Rather, this is Jesus’ active decision: Jesus empties, Jesus humbles. But there is also a reflexive pronoun here: Jesus empties himself, humbles himself. As the Lord, he could humble or empty others. At different points in his ministry he does just this: he humbles others (John 9:39), but he also lifts up those who did not humble themselves, but were humbled by others–passive voice! (Matt. 20:29-34). But the Lord also humbles himself, and not more or less but completely, to death, even to the humiliating death of a cross. “For this reason, God raised him to the highest place”–not only raised him up (hupsoō) but raised him up above everything (huperupsoō)–“and gave him the name above (huper) every name” (Phil. 2:9). The lesson here is that we should do the same: “You should think the same way that Jesus did” (2:4). “Humble yourselves, therefore, under God’s mighty hand, that he may lift you up in due time” (1 Pet. 5:6). [11:33] Oh what rich depth and wisdom and knowledge are God’s, that his decisions are so beyond examining and his paths are untraceable! For who knew the mind of the Lord, or who was his advisor? Who first gave him something so that they would be repaid? Because everything is from him and through him and to him—let the glory be his into eternity. Amen. [12:1] Therefore, I challenge you, brothers and sisters, through God’s compassion, to offer up your bodies as a living, holy sacrifice pleasing to God—your thoughtful worship. And don’t be patterned just like this age, but be transformed by a change of mind, in order to test what the will of God is: good, pleasing, complete. For through the grace given me, I say to each one of you: do not think better of yourself than you should, but think sanely, since God has given a piece of faith to each of you. Because just as we have many parts in one body, and every part does not function the same,  so many of us are one body in Christ, and each person is a part of the others. But we have different gifts based on the grace given to us, whether that’s prophetic—based on one’s piece of faith—  or for service in the church’s ministry; or as a teacher in education;  or as someone who challenges people, encouraging them; someone who shares with others in generosity; someone who leads others by working hard; or someone who happily extends mercy. This section marks the end of a long three chapters on how God has spread Israel’s promises and gifts into all the world (Romans 9-11). Paul then enters into a longer section on how we should respond to all these gifts by offering up everything we are as “a living, holy sacrifice pleasing to God” (12:1-15:13). So in a way, this passage is a sneak peek on the last part of the letter to the Romans too.